January 13, 2017 September 8, 2017 - by HAHAPPY - 8 Comments. Wow, hitting half a century is something to celebrate! 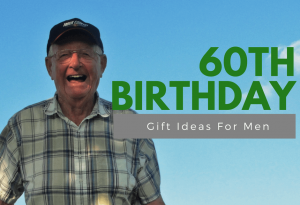 Whether he is your dad, husband, brother, uncle, or your best friend, no doubt you want to celebrate his 50th birthday in extra special with a perfect gift to truly show he is loved. 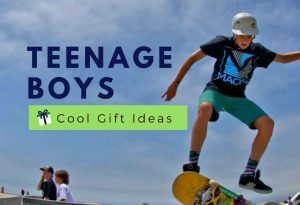 We have a great list of Best Gifts For A 50-Year-Old Man from classic to more adventure, included hobby related gifts, styling gifts, personalized gifts, and health-related gifts. 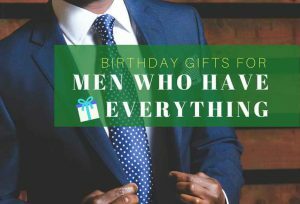 We are pretty sure that this list just saved your time, and you’ll find just the right one for his milestone birthday. 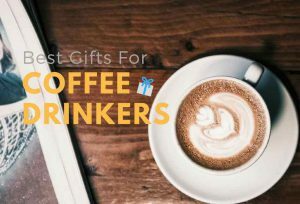 If the 50-year-old man on your list is a lover of coffee and espresso, it’s time to get him a Deluxe Coffee & Espresso Maker.This Deluxe Coffee & Espresso Maker not only gives him freshly brewed coffee with cream as well as delicious, authentic espresso, but it will also make him SMILE on his 50th birthday! 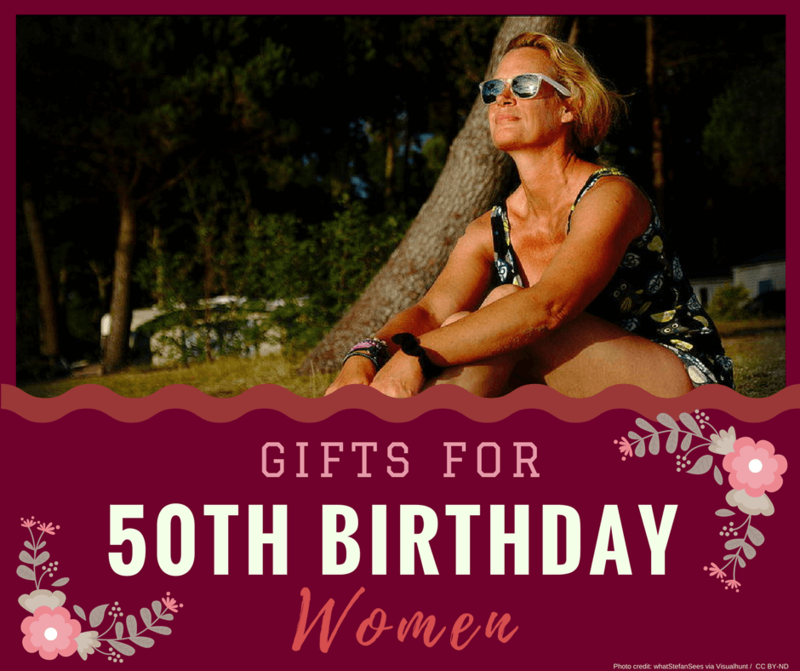 Searching for unique 50th birthday gifts? Men always have a pen in their pocket. So, you can’t go wrong with a personalized pen for his 50th birthday. 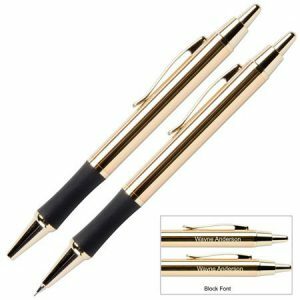 This Monaco 24 Karat Gold Plated Gift Pen and Pencil Set can be personalized with the name of the special man in your life. We’re sure your man will love this idea. If you have been looking for 50th birthday gift ideas for dad, search no more. Almost all men like a good watch. If your budget allows, gifting him a luxury watch is definitely a timeless gift for his 50th birthday. 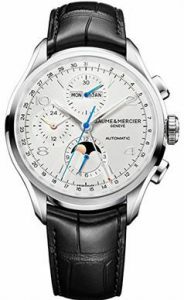 Swiss-made model signed Baume & Mercier Men’s Clifton Chronograph Watch is an excellent option to consider. This sophisticated timepieces from Baume & Mercier is a timeless gift that makes his 50th birthday all the more special. 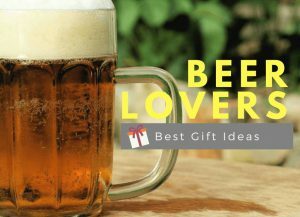 Finding a unique, funny 50th birthday gift ideas for a man who loves beer? This personalized beer mug set is sure to be a big hit with him! 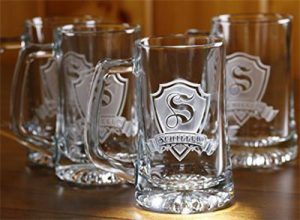 The beer man on your list will not be disappointed with this incredibly personalized beer mug set for his 50th birthday. Looking for 50th birthday gifts for Whiskey drinkers? 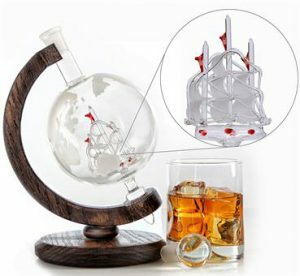 Then this impressive Etched Globe Whiskey Decanter is sure to get their attention. It is one of the most stunning decanters, and it will make drinking whiskey more enjoyable and interesting than before. Perfect 50th birthday gift option for the whiskey-loving man in your life. Flask set a really cool & unique gift for his 50th birthday. He can drink his favorite wine anywhere while remembering the taste of your love. 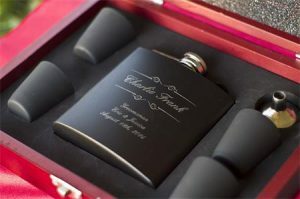 What better way to surprise a wine-loving man than to gift him a personalized flask set for his 50th birthday? 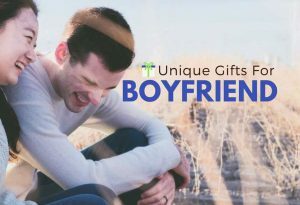 There is no doubt that your special man will absolutely LOVE it. 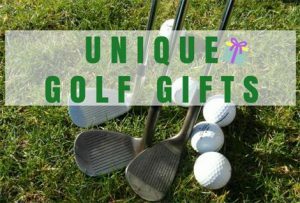 What are the best 50th birthday gift ideas for dad from daughter? At age 50, he is at an age where health is his main concern. H2OPal Smart Bottle Hydration Tracker is an incredible gift to help him to stay healthy as well as turn drinking water into a fun goal. It is a hydration tracker that features in automatically track intake through the water bottle. If you care about his health and want him to have a healthy habit of drinking water, this is the right gift to buy. 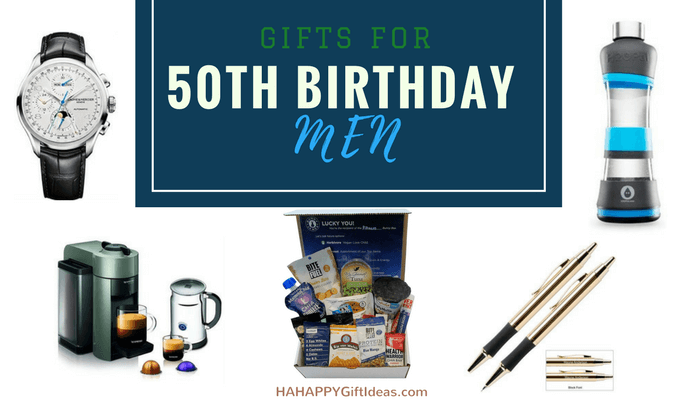 Looking for 50th birthday gifts for men who have everything? 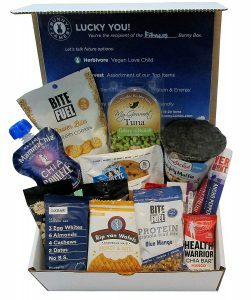 Subscription boxes filled with healthy snacks, bars and cookies are the hot new gift for health-minded men who are turning 50! The Bunny Box is creatively packed with care and grass. 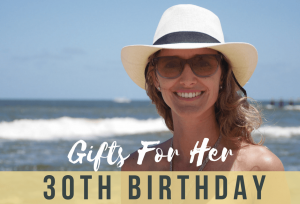 Gifting this awesome healthy gift to treat the special man to this healthy gift for his 50th birthday! He will definitely enjoy exploring all the delicious treats tucked inside. 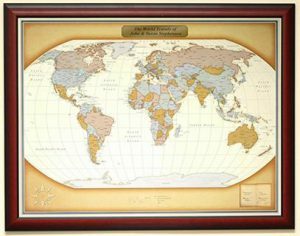 If he is a travel enthusiast, Personalized World Travel Map is more than gifts for his 50th birthday. It’s treasures that he shares his past, present, and future travels while brightening up his wall with a vibrant map. This high-quality Personalized World Travel Map is a perfect gift for the world traveler in your life, and it will be appreciated for years and years to come. As the man you love turning age 50, their back and shoulder muscles need more tender loving care. 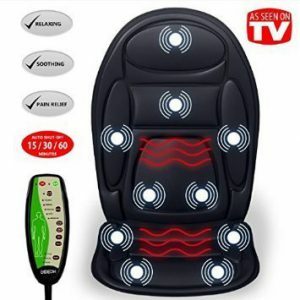 That’s what makes the Gideon™ Seat Cushion Vibrating Massager such one of the thoughtful 50th birthday gift ideas for husband. Let the stress melt away from him while showing your love and care. Most men at age 50 might have many watches. 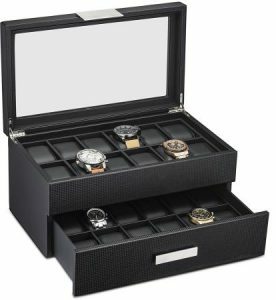 A large and luxury watch storage box is a must need for him to organize his exclusive watch collection. Glenor Co. Luxury Watch Box is the most beautiful luxury watch box to accommodate his expanding watch collection. It is the perfect combination of modern and class and destined to last for decades. Men at age 50 are grown up with vinyl records, buying a vintage, and classic Vinyl Turntable Record Player is a perfect way to make his 50th birthday filled with memories. 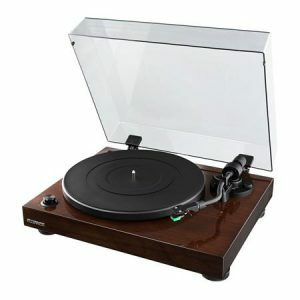 With this cool and awesome Vinyl Turntable Record Player, he can enjoy and listen to their favorite Beatles, Rolling Stones, CSNY, or even older LPs. His soul will be fascinated by the music he loves. 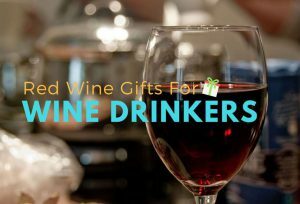 For those men who love the taste of red wine, he will fully appreciate receiving this World’s First and Awards Winning Electronic Wine & Spirit Aerator as a gift for his 50th birthday. 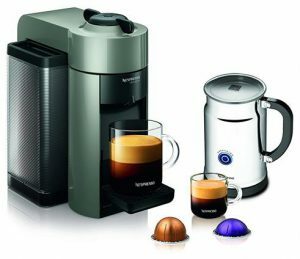 It features the capacity to dispense fully aerated wine or spirits at 1 ounce（28.5ml）every 2 seconds. 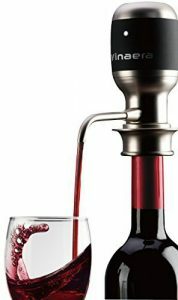 If he drinks red wine a lot, he definitely needs this amazing Electronic Wine & Spirit Aerator. 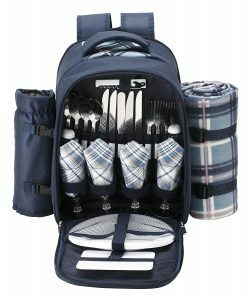 If the 50-year-old man you have in mind enjoys being outside at all, then a functional picnic backpack gift will be appreciated. He will enjoy having such a handy way to take treats out and enjoy a relaxing day. This VonShef Picnic Backpack is a great gift that will never be outdated, and it will be well liked by the receiver. 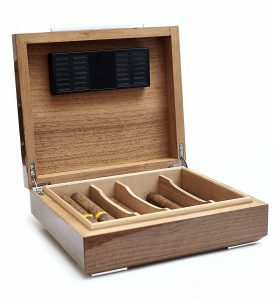 If you’re needing gift ideas for a man who is cigar lover, this celebrated cigar humidor is an excellent gift to make him smile on his 50th birthday and be able to enjoy a good cigar fully. Every cigar enthusiast will LOVE It! By the time turns 50, most of the men may have more concerns about their oral health. So, it’s a great time to give him a new electric toothbrush to whitening his teeth and revitalize his smile. 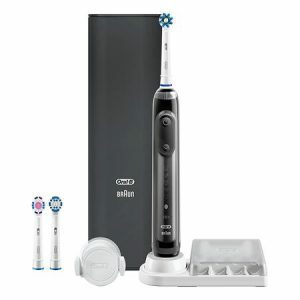 With the new intelligent Oral-B GENIUS 8000, he is getting superior teeth cleaning experience. 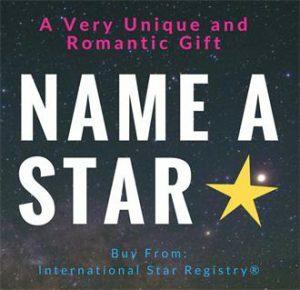 Looking for the best gift to show how much you care about his 50th birthday? Since shaving is an essential part of everyday men’s lives, so you can rejoice him by giving him an excellent electric shaver, he will surely be thrilled. 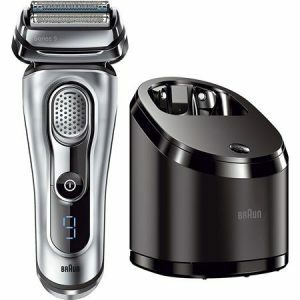 Braun Series 9 is the most efficient and comfortable shaver from Braun, the World’s #1 Foil Shaver Brand. This is a great site. If you want to give an old man the gift that keeps on giving, give him an iPhone. If he’s like my dad he’ll be asking you how to use it overtime the thing rings. Nice watch at number 3. I think I’ll spring for that one instead of the iPhone. Hi, Thanks for your nice words and we’re glad that you like our picks. My dad is so hard to buy for every year whether it’s birthday or Christmas. Even when I ask him he usually has no idea because what ever he needs he just buys when he needs it. Thank you for your comment, hope your Dad will love our suggestion too. 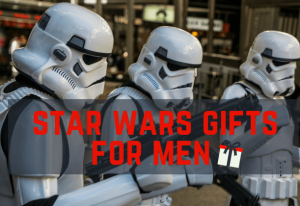 Some great gift ideas for the men in our lives who always seems to be difficult to buy for, especially as they get older. My two son in laws particularly come to mind and I’m already trying to think of ideas for a birthday coming up and Christmas presents, yes it’s only 14 weeks ’til Xmas. Not to worry, I’ve seen three very suitable pressies for them here in this post and I thank you very much for it. What are they? The personalized beer mugs, the unusual globe whisky decanter (he saves decanters) and the world travel map. Thank you so much for this blog. Hi HaHappy, Just in the nick of time. I am turning 50 this year and I am so very glad to have found your article and website. There are quite a few items that I would be happy to receive so I have sent your site over to my wife, 3 sons, sister and brother. I hope they get the hint and do their home work. Great choices you have chosen.